To mark this event is therefore a key landmark for custodians of heritage and educators alike. The commemoration provides the opportunity for museums, galleries, archives, libraries, the creative industries, universities, colleges and schools to work together to provide a user experience made possible through innovative digital technologies that is as personal, rich and vivid as it is focused; an experience that offers the user the ability to contextualise their own understanding and customise resources in line with their own learning and research priorities. However, in order to effectively scope how public service organisations could achieve this aim, it was first necessary to understand what content was available, under what conditions and where it was located. In short, a full audit of collections and assets pertaining to the First World War needed to be undertaken and shared between these organisations. 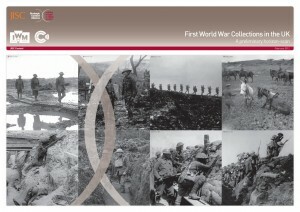 Therefore, in late 2011, the Imperial War Museums, was commissioned, funded and supported by JISC and the Wellcome Trust, to produce the attached guide to First World War collections held across the UK. The guide provides information on which archive, museum or library across the UK has material relevant to the First World War. This is the first iteration of a growing body of research on this topic and is not comprehensive. Further research on First World War content and collections available to education in analogue and digital form will be undertaken as part of the JISC WW1 Discovery programme by King’s College London and will be openly released in March 2012. Posted by Sarah Fahmy on February 7, 2012 in Uncategorized.